To remember Guy Lombardo, you have to be of a certain age. To appreciate Guy Lombardo, I’m sure you qualify. Allow me to introduce him to you. Photo of band leader Guy Lombardo, 28 June 1944. Gaetano Alberto Lombardo was born on June 19, 1902 in London, Ontario. He died in November 5, 1977, at the age of 75, in Houston, Texas. He was a Canadian/American bandleader and violinist. “The Royal Canadians” was formed by Guy Lombardo in 1924 with his brothers Carmen, Lebert, and Victor and other musicians from his hometown, Lombardo led the group to international success. They billed themselves as creating “The Sweetest Music This Side of Heaven.” The Lombardos are believed to have sold between 100 and 300 million phonograph records during their lifetimes. Lombardo and his brothers formed their first orchestra while still in grammar school and rehearsed in the back of their father’s tailor shop. They first performed in public with his brother Carmen at a church lawn party in London in 1914. In 1938, Lombardo became a naturalized citizen of the United States. Although Lombardo’s “sweet” big-band music was viewed by some in the jazz and big-band community of the day as “corny”, trumpeter Louis Armstrong famously enjoyed Lombardo’s music. Lombardo is best known for almost a half-century of New Year’s Eve big band remotes, first on radio, and then on television. Lombardo’s orchestra played at the Roosevelt Grill in the Roosevelt Hotel in New York City from 1929 to 1959, and from then until 1976 at the Waldorf Astoria Hotel. Live broadcasts (and later telecasts) of their performances were a major part of New Year’s celebrations across North America; millions of people watched the show with friends at house parties. Because of this popularity, Lombardo was called “Mr. New Year’s Eve”. The Royal Canadians were noted for playing the traditional song Auld Lang Syne as part of the celebrations. Their recording of the song still plays as the first song of the new year in Times Square. Guy Lombardo has three stars on the Hollywood Walk of Fame in Los Angeles (I didn’t know some have more than one!). There is a bridge named after him in London, Ontario near Wonderland Gardens, as well as Lombardo Avenue in north London near the University of Western Ontario. I would highly recommend you listen to this New Year audio clip from CBC. You could also listen to an interview in 1959 at Radiotapes.com. And if you would still like to hear more, I suggest listening to Paper Tape Archive: Guy Lombardo at Hotel Roosevelt (1949). Tomorrow, May 19, is Victoria Day, acknowledging Queen Victoria’s birthday. So for today’s post, allow me to introduce you to Alexandrina Victoria. She was born on May 24, 1819 (Kensington Palace, London), and died on January 22, 1901 (Osborne House, Isle of Wight) at the age of 81. The official name for this annual celebration is Victoria Day, and in French it’s called Fête de la Reine. Some also call it May Long Weekend, May Long, May Two-Four, or May Run. It is also informally considered as the beginning of the summer season in Canada. It is celebrated every year on the Monday preceding May 25. This year, it falls on May 19th. Canada started celebrating the Queen’s birthday on May 24, 1845, when the legislation first passed by the parliament of the Province of Canada. One year, however, the celebrations were marred by tragedy. In 1881, a passenger ferry named Victoria overturned in the Thames River, near London, Ontario. The boat departed in the evening with 600 to 800 people on board—three times the allowable passenger capacity—and capsized part way across the river, drowning some 182 individuals, including a large number of children who had been with their families for Victoria Day picnics at Springbank Park. The event came to be known as the Victoria Day disaster. The holiday is colloquially known as May Two-Four in parts of Canada. It’s a double entendre that refers both to the date around which the holiday falls (May 24) and the Canadian slang for a case of twenty-four beers (a “two-four”), a drink popular during the long weekend. When Alexandrina was but a year old, her father died. Consequently, she was brought up by her mother, Princess Victoria of Saxe-Coburg-Saalfeld. She later described her childhood as “rather melancholy.” Her mother was extremely protective. Alexandrina was raised largely isolated from other children. She lived by an elaborate set of rules and protocols. Her mother hired an ambitious and domineering comptroller, Sir John Conroy, for her. Together they prevented the princess from meeting people whom her mother and Conroy deemed undesirable, which included most of her father’s family. She shared a bedroom with her mother every night, studied with private tutors on a rigid timetable, and spent her play hours with her dolls and her dog, Dash. In October 1835, Alexandrina contracted a severe fever, which Conroy dismissed as a childish pretence. While she was ill, Conroy and her mother unsuccessfully badgered her to make Conroy her private secretary. As a teenager, Alexandrina resisted persistent attempts by her mother and Conroy to appoint him to her staff. Once queen, she banned him from her presence, but he remained in her mother’s household. Her mother’s brother, Leopold, had been King since 1831. Leopold arranged for Alexandrina’s mother to invite her relatives to visit her in May 1836. It was at this time that she first met Prince Albert of Saxe-Coburg and Gotha, and Prince Alexander of the Netherlands, as possible suitors. According to her diary, she enjoyed Albert’s company from the beginning. After the visit she wrote, “[Albert] is extremely handsome; his hair is about the same colour as mine; his eyes are large and blue, and he has a beautiful nose and a very sweet mouth with fine teeth; but the charm of his countenance is his expression, which is most delightful.” Alexander, on the other hand, was “very plain”. Victoria turned 18 on May 24, 1837. On June 20 that year, William IV died at the age of 71, and Victoria became Queen. Official documents prepared on the first day of her reign named her as Alexandrina Victoria, but the first name was withdrawn at her own wish and never used again. She inherited the revenues of the duchies of Lancaster and Cornwall, and was granted a civil list of £385,000 per year. Financially prudent, she paid off her father’s debts. At the start of her reign Victoria was popular, but her reputation suffered in 1839 because of an incident involving one of her mother’s ladies-in-waiting, Lady Flora Hastings. She developed an abdominal growth that was widely rumoured to be an out-of-wedlock pregnancy by Sir John Conroy. Victoria believed the rumours. At first, Lady Flora refused to submit to a naked medical examination, until in mid-February she eventually agreed, and was found to be a virgin. Conroy organised a press campaign implicating the Queen in the spreading of false rumours about Lady Flora. When Lady Flora died in July, the post-mortem revealed a large tumour on her liver that had distended her abdomen. At public appearances, Victoria was hissed and jeered. Though queen, as an unmarried young woman Victoria was required by social convention to live with her mother, despite their differences, and exasperated with her mother’s continued reliance on Conroy. Her mother was consigned to a remote apartment in Buckingham Palace, and Victoria often refused to even meet with her. Victoria complained of her mother’s close proximity, expecting “torment for many years”. It was proposed that could be avoided by marriage. She thought of Albert’s education for the future role he would have to play as her husband, but she resisted attempts to rush her into wedlock. Albert became an important political adviser as well as the Queen’s companion. Through Albert’s mediation, relations between mother and daughter slowly improved. Edward Oxford shooting at Queen Victoria, June 10, 1840. (19 April 1822 – 23 April 1900) He was the first of eight people who tried to assassinate Queen Victoria. During Victoria’s first pregnancy in 1840, 18-year-old Edward Oxford attempted to assassinate her while she was riding in a carriage with Prince Albert on her way to visit her mother. Oxford fired twice, but either both bullets missed or, as he later claimed, the guns had no shot. He was tried for high treason and found guilty, but was acquitted on the grounds of insanity. In the immediate aftermath of the attack, Victoria’s popularity soared again. Her daughter, also named Victoria, was born on 21 November 1840. The Queen hated being pregnant. Nevertheless, over the following seventeen years, she and Albert had a further eight children: Albert Edward, Prince of Wales (b. 1841), Alice (b. 1843), Alfred (b. 1844), Helena (b. 1846), Louise (b. 1848), Arthur (b. 1850), Leopold (b. 1853) and Beatrice (b. 1857). In 1845, Ireland was hit by a potato blight that became known as the Great Famine. In the next four years over a million people died. She personally donated £2,000 to famine relief, more than any other individual donor, and also supported the Maynooth Grant to a Roman Catholic seminary in Ireland, despite Protestant opposition. In 1853, Victoria gave birth to her eighth child, Leopold, with the aid of the new anaesthetic, chloroform. Victoria was so impressed by the relief it gave from the pain of childbirth that she used it again in 1857 at the birth of her ninth and final child, Beatrice. In March 1861, Victoria’s mother died, with Victoria at her side. To relieve his wife during her intense and deep grief, Albert took on most of her duties, despite being ill himself with chronic stomach trouble. By the beginning of December, Albert was diagnosed with typhoid fever. He died on December 14, 1861. Victoria was devastated. She entered a state of mourning and wore black for the remainder of her life. She avoided public appearances. Through the 1860s, Victoria relied increasingly on a manservant from Scotland, John Brown. Before long, there were slanderous rumours of a romantic connection. The story of their relationship was the subject of the 1997 movie Mrs. Brown. Victoria’s self-imposed isolation from the public diminished the popularity of the monarchy. On the last day of February 1872, 17-year-old Arthur O’Connor (great-nephew of Irish MP Feargus O’Connor) waved an unloaded pistol at Victoria’s open carriage. Brown, who was attending the Queen, grabbed him and O’Connor was later sentenced to 12 months’ imprisonment. As a result of the incident, Victoria again became popular. Following a custom she maintained throughout her widowhood, Victoria spent the Christmas of 1900 at Osborne House on the Isle of Wight. Rheumatism in her legs had rendered her lame, after a fall years earlier. Her eyesight was clouded by cataracts. Through early January, she felt “weak and unwell”, and by mid-January she was reported to be “drowsy, dazed, and confused“. She died on Tuesday, January 22, 1901, at half past six in the evening, at the age of 81. Her son and successor King Edward VII, and her eldest grandson, Emperor Wilhelm II of Germany, were at her deathbed. Her favourite pet Pomeranian, Turri, was laid upon her deathbed as her last request. 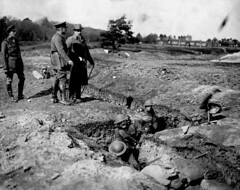 Britain declared war on Germany on August 4, 1914, and Prime Minister Borden had already promised to send a Canadian army. It was something of a miracle that the first contingent of 33,000 men was ready to sail from Quebec on October 3, 1914. The incredible Minister of Militia (see my post February 13: And The Lion – See It Cowers) was largely responsible. He had many critics, but said: “My critics will stop their yelping as a puppy-dog chasing an express train gives up its job as a useless task.” He was the express train. Sir Sam, as he became, personally supervised the embarkation from Quebec of 33,000 men and 7,000 horses. The horses would not walk the gangplank to get into the ships, so they had to be lifted on board in slings. Sir Sam was a great man for getting things done in a hurry, but when the first convoy sailed, 800 horses and nearly 5,000 tons of ammunition and supplies had been left behind. There were thirty troop transport ships escorted by three battleships and six cruisers, most of them twenty years old. As there was great danger from German submarines and surface raiders, the landing point in Britain was changed several times while the convoy was crossing the Atlantic. It arrived at Plymouth on October 14 and was met by General Alderson, commander of the Canadian forces, who had preceded them. Wemyss felt it would have been safer if the ships had sailed on their own, not bunched together, with the sea lanes protected as much as possible by the warships. Many ship captains felt the same way in World War II. They Will Become So American! Although John A. Macdonald said in 1865 that he did not think the Prairies were of any use to Canada, he changed his mind quickly after Confederation. The United States bought Alaska from Russia in 1867 for $7,200,000. In those days some people called the deal “Seward’s folly,” because American Secretary of State Seward had negotiated it. They had to eat their words later on. The United States took about $100 million worth of gold out of Alaska, not to mention other assets. The U.S. was now looking at the Northwest. If Alaska could be picked up for $7.2 million, why not get the territory in between? Prime Minister Macdonald decided Canada should get there first. Ottawa obtained secret copies of those documents, and immediately informed the Hudson’s Bay Company that it would have to sell its territory to Canada. The Government then created the Northwest Territories out of Rupert’s Land, to be administered by a lieutenant-governor and council. 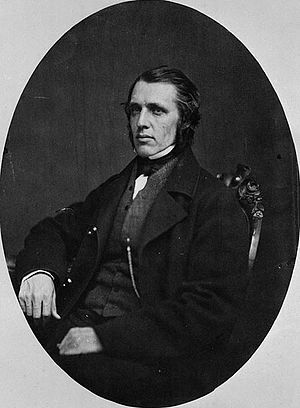 William H. McDougall was appointed lieutenant-governor on September 28, 1869, and left immediately for Fort Garry. The consequences of the hurried arrangements were severe and will be the subject of future stories. The British Government put pressure on the Hudson’s Bay Company to surrender its territory to Canada, and the price was set at £300,000, equivalent then to $1.5 million. The money was supposed to be paid on October 1, but Canada was unable to raise a loan in London and the deal was delayed until December 1, 1869. If you would like to read more about today’s post, I would suggest the Library and Archives Canada, and then I would suggest visiting Sarah StAngelo who has put together an interesting presentation. I also suggest the Dictionary of Canadian Biography to learn more about William McDougall. When Does “Daring” Become “Foolish”? This is not the most important thing that has happened in Canada on September 15 over the years, but it is perhaps one of the most colourful. Edward Prince of Wales came to Canada in 1860 representing Queen Victoria. He opened Victoria Bridge in Montreal, laid the cornerstone of the original Parliament Buildings in Ottawa, and presided at several important functions. When Queen Victoria died, he became King Edward VII. Edward was only a young man when he came to Canada in 1860, and efforts were made to see that he had a good time, despite his dour guardian, the Duke of Newcastle. One of the entertainments was a visit to Niagara Falls on September 15, where he saw an astonishing performance by the great French tightrope walker Blondin, whose real name was Jean François Gravelet. A tight-rope was stretched across the river, over the roaring cauldron of the falls, and Blondin crossed to the other side carrying a man on his back! When he returned, he amazed everyone by getting on stilts and walking across on them! The Prince was so delighted that he gave Blondin a purse of $400. They became great friends and Blondin eventually went to live in London, where he died in 1897 at the age of eighty. 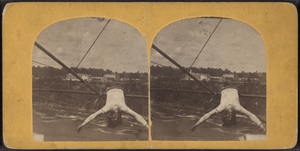 Blondin walked the tightrope over Niagara Falls a number of times. It was 1, 100 feet long, and 160 feet above the water. The first time, in 1859, he went across blindfolded. Then he crossed in a sack. On another occasion he pushed a wheelbarrow. Perhaps his greatest achievement was that of carrying a small stove to the half way mark, and balancing there while he cooked and ate an omelette. 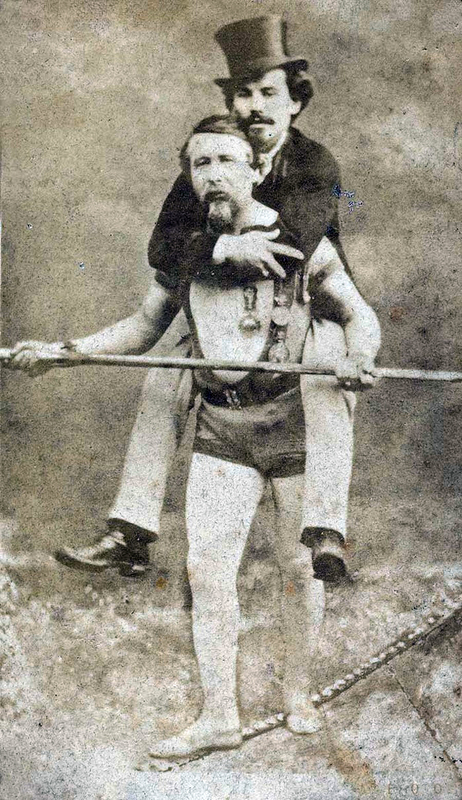 Blondin kept stunting in other parts of the world until he was seventy-nine, and he never had a serious accident. His last performance was in Belfast, Ireland. To read more about Niagara Falls “artists”, I suggest going to Niagara Parks Canada. The building of the C.P.R. transcontinental is one of the most fascinating stories in Canadian history, and many books have been written about it. The agreement creating it was signed in London, England, on September 14, 1880. The first C.P.R. was organized by Sir Hugh Allan of Montreal, but was disbanded when it was discovered that he had contributed a large sum of money to Sir John A. Macdonald and other members of the Government for an election campaign. The Macdonald government had to resign and was out of office for five years. Strangely enough, the man who struck the last blow forcing the Macdonald government to resign was Sir John’s old friend Donald A. Smith, who had been his emissary in dealing with Louis Riel during the Red River uprising. When the C.P.R. company was formed in 1881, Donald Smith could not be included among the board of directors because he had defeated the Macdonald government. He and George Stephen of the Bank of Montreal, had made a fortune from the St. Paul and Pacific Railway in the United States, although it had gone bankrupt. George Stephen was president of the new C.P.R. and one of the directors was John Rose, a lifelong friend of Macdonald’s. When they were young they had put on shows in the United States in which Rose acted as a dancing bear while Macdonald provided musical accompaniment. There was more profit in railway building. The House of Commons passed the C.P.R. bill on February 1, 1881. It gave the company $25 million, and 25 million acres of land for development. The C.P.R. was also given 710 miles of railway that had been built by the Government at a cost of nearly $38 million. The transcontinental was completed on November 7, 1885, at Craigellachie, British Columbia. Once again Donald A. Smith got in the last blow. By this time he had become one of the directors, and as such, he was given the honour of driving home the last spike.